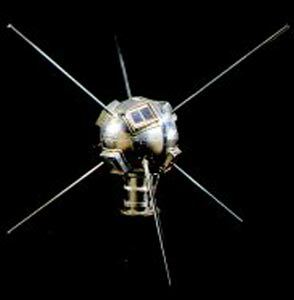 Vanguard 1 was a small earth-orbiting satellite designed to test the launch capabilities of a three-stage launch vehicle and the effects of the environment on a satellite and its systems in Earth orbit. It also was used to obtain geodetic measurements through orbit analysis. The spacecraft was a 1.47 kg aluminum sphere 15.2 cm in diameter. It contained a 10-mW, 108 MHz mercury-battery powered transmitter and a 5-mW, 108.03 MHz transmitter powered by six solar cells mounted on the body of the satellite. Six short aerials protruded from the sphere. The transmitters were used primarily for engineering and tracking data, but were also used to determine the total electron content between the satellite and ground stations. Vanguard also carried two thermistors which measured the interior temperature over 16 days in order to track the effectiveness of the thermal protection. At launch the booster ignited and began to rise but about 2 seconds after liftoff, after rising about four feet, the Vanguard rocket lost thrust and began to settle back down to the launch pad. As it settled against the launch pad the fuel tanks ruptured and exploded, destroying the rocket and severely damaging the launch pad. The Vanguard satellite was thrown clear and landed on the ground a short distance away with its transmitters still sending out a beacon signal. The satellite was damaged, however, and could not be reused. It is now on display at the Smithsonian Air and Space Museum. The exact cause of the accident was never determined, presumably it was due to a fuel leak between the fuel tank and the rocket engine, possibly due to a loose connection in a fuel line or low fuel tank pressure allowing some of the burning fuel in the thrust chamber to leak back into the fuel tank. Vanguard TV3BU failed also to reach orbit. Vanguard 1 was placed into a 654 × 3969 km 134.2 minute orbit inclined at 34.25 degrees by the three stage Vanguard launch vehicle. Original estimates had the orbit lasting for 2000 years, but it was discovered that solar radiation pressure and atmospheric drag during high levels of solar activity produced significant perturbations in the perigee height of the satellite, which caused a significant decrease in its expected lifetime to only about 240 years. The battery powered transmitter stopped operating in June 1958 when the batteries ran down. The solar powered transmitter operated until May 1964 (when the last signals were received in Quito, Ecuador) after which the spacecraft was optically tracked from Earth. An additional flight back up is now on display in the Space Science exhibition station at the Steven F. Udvar-Hazy Center in Chantilly, VA.